After leaving Magic City, the band went through several changes in both name and personnel and became one of the biggest bands on the local Detroit music scene. At this point the band hired a bass player Ben “Rat Bass” Adkins, who brought with him the name of his former band, ‘Energy’. By then borrowing Albert Einstein’s formula for special relativity (E=MC2) and adding it to their inherited name ‘Energy’ they finally became ‘Energy MC2’ (a move deemed necessary to distinguish themselves from Adkins former band)As Energy MC2 the band soon began to seriously record original material which included the previously unissued 70’’s track “If You Break It”. 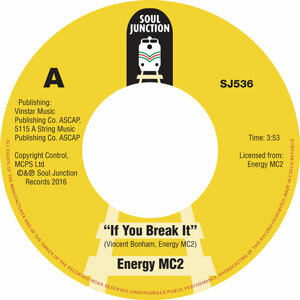 The group line up on “If You Break It” included Vincent Bonham, Ufuomo Akill-Wallace, Arnell Carmichael, Ernestro Wilson, Opelton Parker, Gordon Carlton, Eric Wallace, Leon Lopez, Marvin Carlton and Marlene Rice. While an earlier session had too yielded a further two previously unissued songs firstly the flipside of this 45 “Other Side Of The Mirror” which featured the same line-up of musicians as “If You Break It” but with the addition of a second female vocalist Gwen Laster, while the second song “Juliane” a beautiful mellifluous ballad can befound on the ‘We Got A Sweet Thing Going On’ volume 2 SJCD 5011 cd album. A later collaboration with Opelton Parker’s brother, Ray (Parker Jr) would see Energy MC2 members Vincent Bonham and Arnell Carmichael leave to become part of the Band ‘Raydio’later to be known as ‘Ray Parker & Raydio’. While other Energy MC2 musicians became part of the band ‘Parlete’ (part of the P-Funk family) helping George Clinton land the Mothership!.